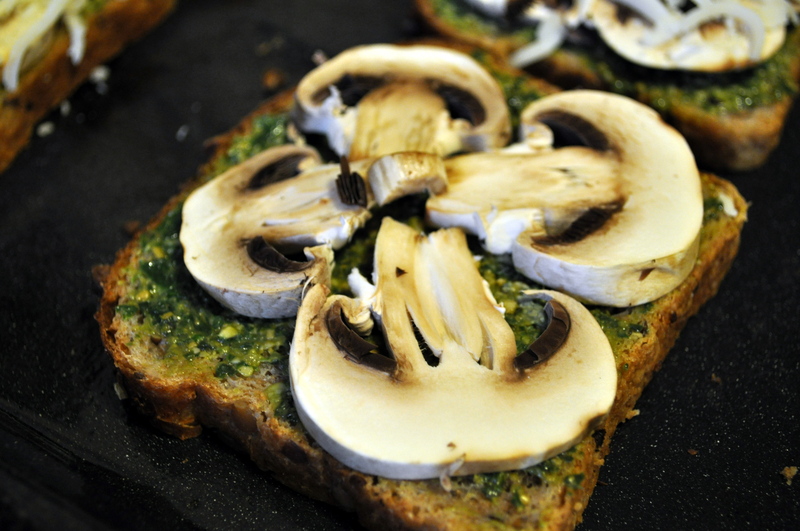 Hooray for pesto! 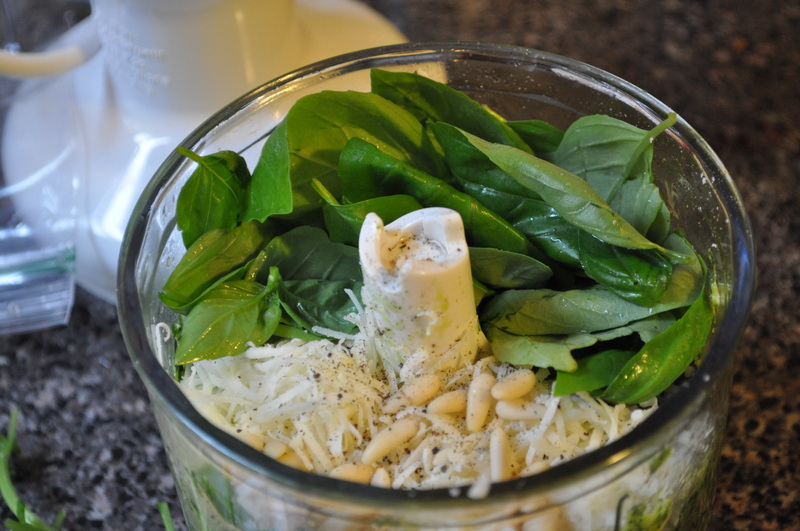 What a beautiful thing pesto is. Easy to make, and it gives a wonderful flavour to sandwiches, pastas, risotto, pizza, baked potatoes, salads, chocolate cake, wait, what? Just trust me, it’s good stuff. Want to make some yourself? Okay, follow me. 1. 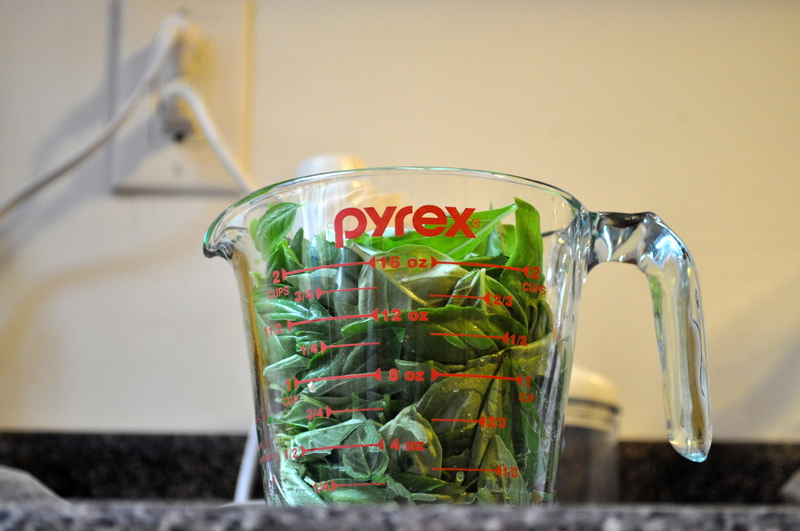 Go pick some fresh basil out of your garden (or buy some, just make sure it’s very fresh), wash it well and then measure 2 cups’ worth. Without the stalks. 2. Squish it down, so it’s firmly packed. 3. Put it in your food processor (I hope yours is bigger than mine) along with 3 cloves of garlic that you have just roasted in a pan for about 10 minutes on medium heat, along with about 4 tablespoons of pine nuts which you roasted after you roasted the garlic. Don’t burn yourself when you peel the garlic. Add about 1/2 a teaspoon of salt and a good amount of freshly ground black pepper. You’ll also want to add about 1/2 a cup of parmesan cheese (not the stuff that comes in the bottles! The real thing, and grate it yourself, please!) Add some olive oil and whizz it all up until you get a consistency you like. It will be somewhere between 1/3 and 1/2 a cup of olive oil. 4. Stop, and admire the beauty that is fresh, home-made pesto. 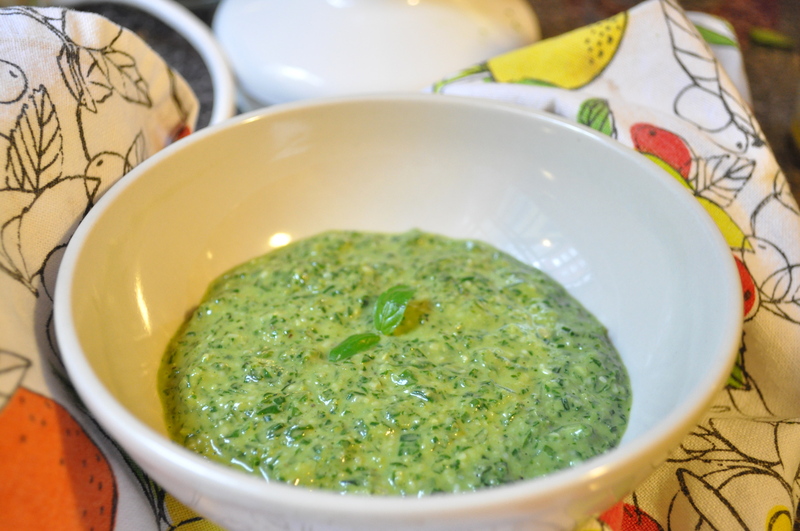 But don’t stop too long, because pesto is better tasted than looked at. 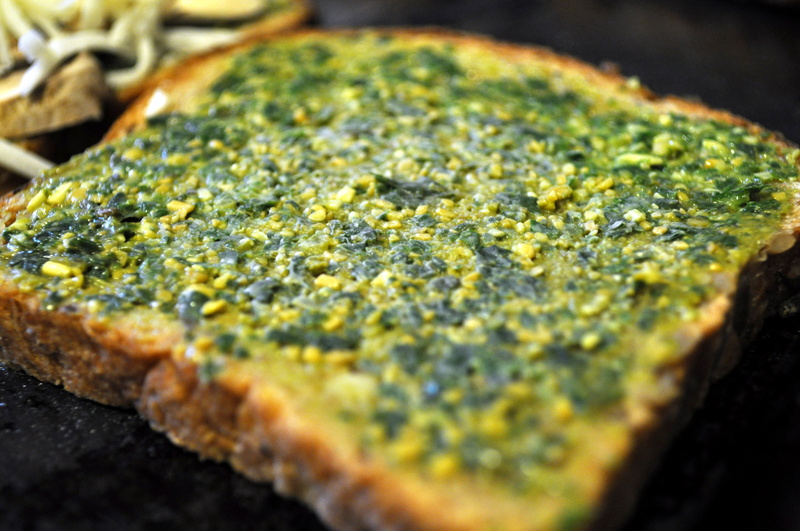 Spread some pesto on a slice of good bread. 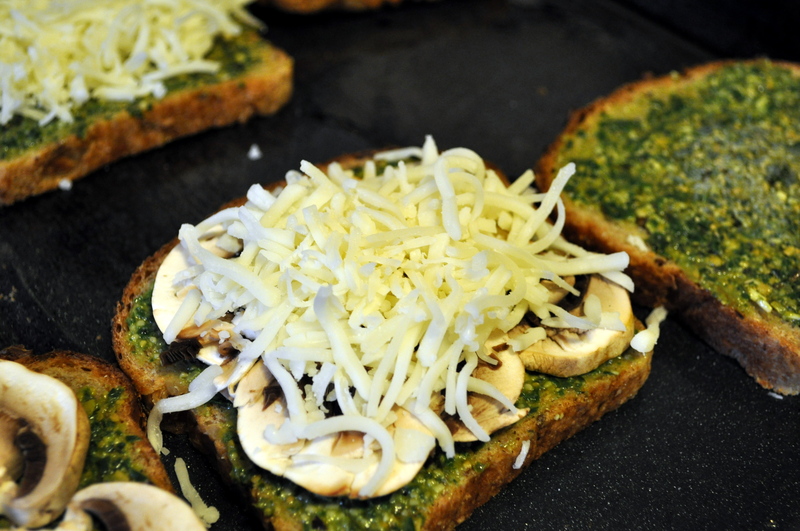 If your bread is straight from the freezer, like mine, it will get a cool frozen pesto spot in the middle too. Grill in the oven until the cheese is melted and slightly brown. 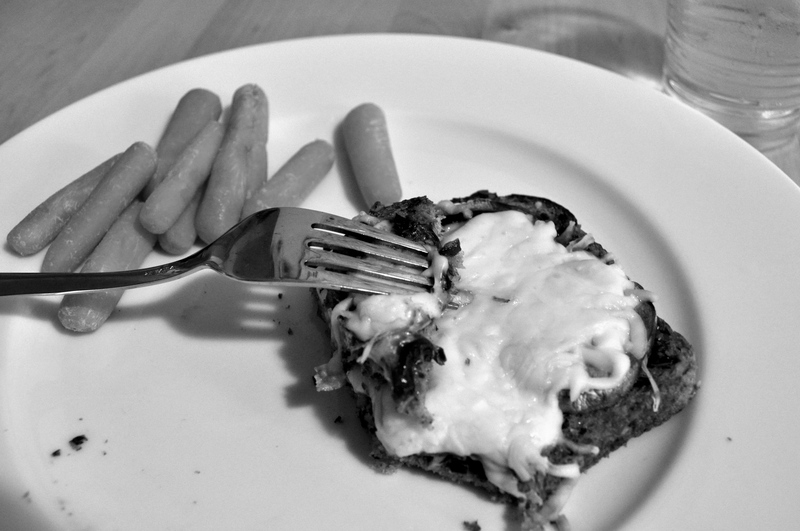 Throw in some carrot sticks and call it healthy. Man, looks amazingly delicious! Maybe you should think about opening a lunch shop that only serves pesto (well, in or on or inbetween other tasty things). Reading this just before lunch time – boy, am I hungry now! 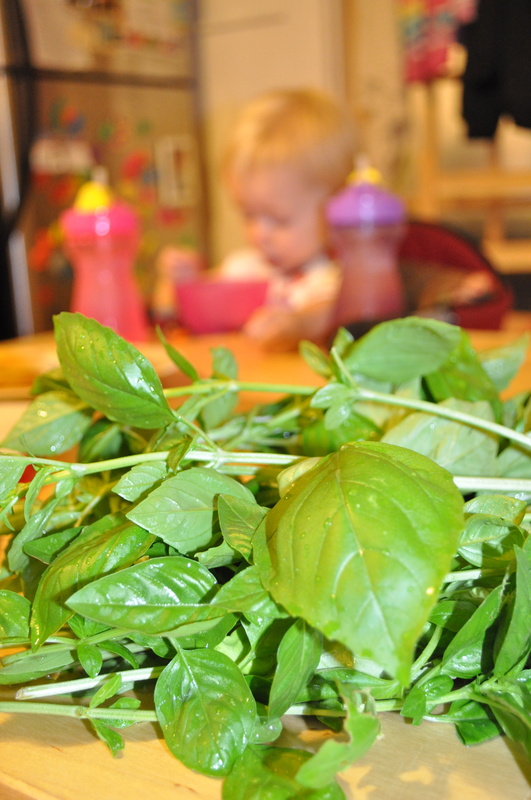 Tonight’s supper of Margherita pizza will now be pesto pizza. Mmmm this looks delish. Will have to keep this recipe and give it a try sometime.